I’ve talked a bit before about how I’ve fed my chickens their own eggs. You can scramble them up, and the chickens go nuts for it. It’s a nice way to get them nutrition and cut down on the ever growing pile of eggs on the counter. The key part is that you scramble them. 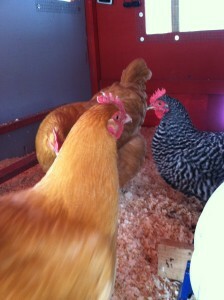 If the chickens make the connection that the eggs they lay in the coop contain food, then you may have a problem on your hands. I have had an episode or two with this sort of egg eater, and I’m trying to work it out. The first incident happened when I went to clean the coop. The chickens like to watch me do this for some reason. I assume it’s that they feel superiority over me because I am touching their poop. You know what chickens? Everyone feels superior to me, so you’re not special. Anyway, once I’ve cleared out the smelly stuff and put in new bedding, I usually toss some treats in there so they scratch around in the shavings and mix up any poop that’s still in there. Their excitement is probably due to the expectation of treats. I’m sure it’s not that they enjoy my sparkling conversation. 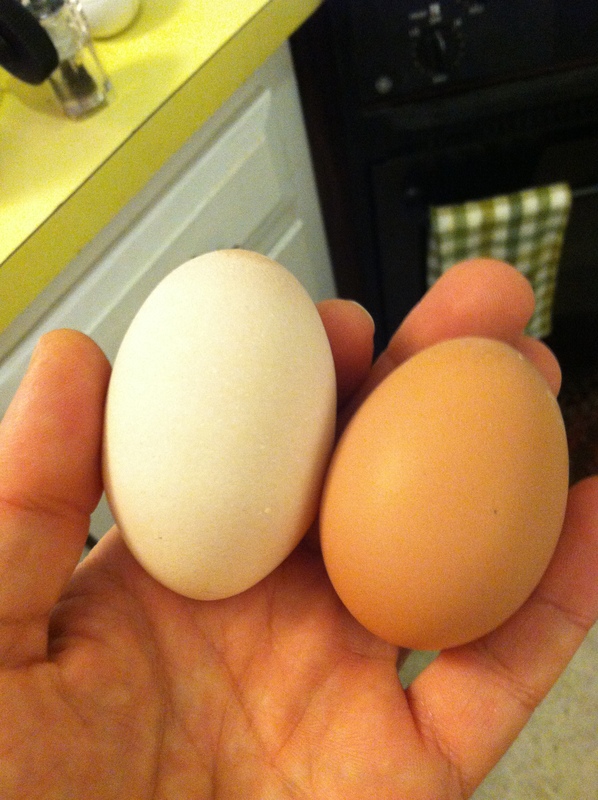 One day, when I opened the back door to get cleaning, there was an egg in the shavings, and a chicken in the coop. The chicken ran over to the egg, pecked it, it broke, and she began to chow down on the goodies within. I grabbed the broken egg as fast as I could and tossed it in the compost, but I was a little alarmed. “Why would she do that right in front of me?” I thought. I posted on a messageboard what had happened, and within five minutes the first “you have to kill that bird” response came in. I seem to get these a lot. I don’t think I’d have any chickens left if I listened to them all. I understand that if this is your livelihood, you don’t want a chicken eating the profits. But I’m an experimenter, and I wanted to figure out why this happened. This was just the first time, and while maybe this was the start of a bad habit, maybe it wasn’t. I wanted to see if it happened again. I began to suspect that maybe the excitement over treats had something to do with it. Maybe the chicken saw the egg, thought it was a treat, and acted accordingly. I posed this to the forum, but no one had any input on it. “Kill it,” they said again. A clue that stood out to me was that the egg in question was one of the pale, flimsy ones that sometimes appear. I’m not sure which one of them is doing it, but someone lays very thin shelled eggs now and again. Maybe every couple of weeks. I give them calcium, but sometimes this still happens. 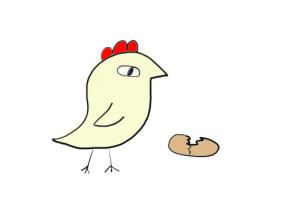 I thought that maybe the chicken happened to peck at the egg just to see what was up, and it was thin, so it broke, and “oh hey candy!” I decided to not bring this up with the “kill that chicken” set, but this was the theory I went with. Over the course of the next several months, I found two more eggs that had been cracked open. Neither had been entirely eaten. Both were pale, thin eggs. I felt my theories were being borne out, but at the same time, I was a little worried that they might move on to eating the other eggs after a while. There is the chance that one egg eater will teach the others the skill, and then you’ve got trouble. I looked up how to handle this end of it, and chose my method. Chickens apparently don’t like mustard. If you blow an egg out of the shell, and then fill the shell with mustard, Lady Eats-Eggs-A-Lot will come along, try to eat the egg, get a mouthful of mustard, and that’s the end of that. The problem was that since this was only happening with one type of egg – the pale, weird variety – I wanted to use that type of egg to do this. I actually had to take back an egg I had given my parents in order to get the right kind. They don’t happen that often. 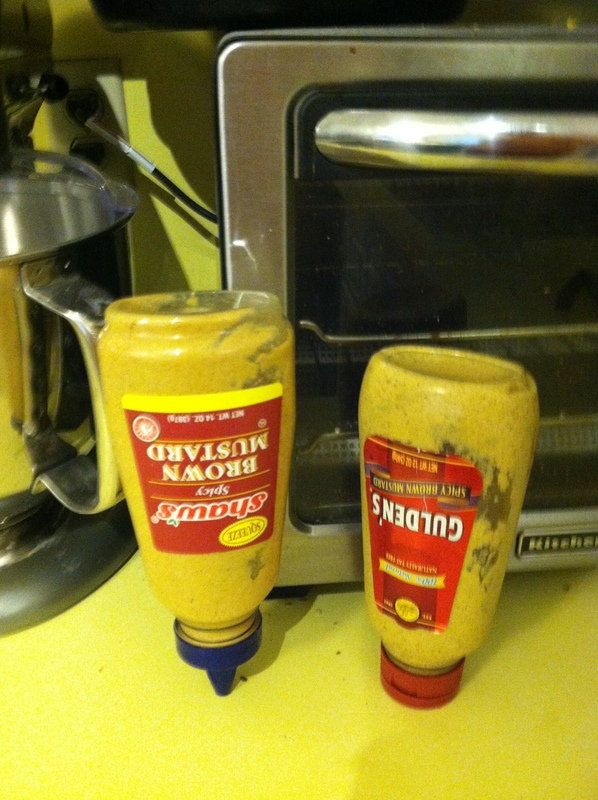 I went to fill it up with spicy brown mustard, but we had two bottles that weren’t that full, and didn’t help much. So I supplemented that with yellow mustard, which we had a lot of, because apparently no one likes yellow mustard. Then, for a tiny bit of perverse irony, I put a shot of rooster sauce in there, even though people say chickens can’t taste hot sauce. Just let me have my fun, people. 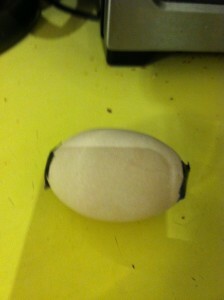 I taped up both ends of the egg to slow leakage, and put it in the coop. Not even duct tape would stick that well to the egg, but I did my best. The chicken I suspect of being the egg eater, a Mandrell Sister, was the first on the scene. She approached the egg, and rolled it back towards herself a couple of times. Chickens sometimes scoot the eggs along the floor with their chins. I guess when you don’t have hands you have to make do. She then began to tap it a little, as if to test the strength. Then she found the tape, pulled it off, and “oh hey candy!” She got a mouthful of mustard, did a little head twitch that seemed to indicate that she didn’t like it, but went back for more anyway. By now others had shown up, and a couple gave it a taste. I figured I’d let them all in on the idea that egg eating is wrong. They all had more than one serving, even though they twitched after every bite. I decided I might be making it worse by letting them continue to feast, so I took the egg away, and hoped they got the message. This totally looks like a normal egg. The big thing I took away from this was that the first chicken seemed to be doing some sort of quality control on the egg. She tapped it a bunch, and with these pale eggs, the shell is pretty weak. I’m now thinking that the eggs that have gotten eaten, or at least cracked open, can’t withstand a gentle peck, and that’s why they broke. I don’t know if they do this to reject bad eggs, or if they just like pecking the eggs. I don’t think the eating is habitual, at least not yet. As I keep saying, those eggs are few and far between, and sometimes they’re tougher than others. I gave the chickens the mustard test, so we’ll see how it goes. We got a weird egg on Tuesday, but it was in one piece. Meanwhile, no necks will be wrung over this. I just want to understand, man. 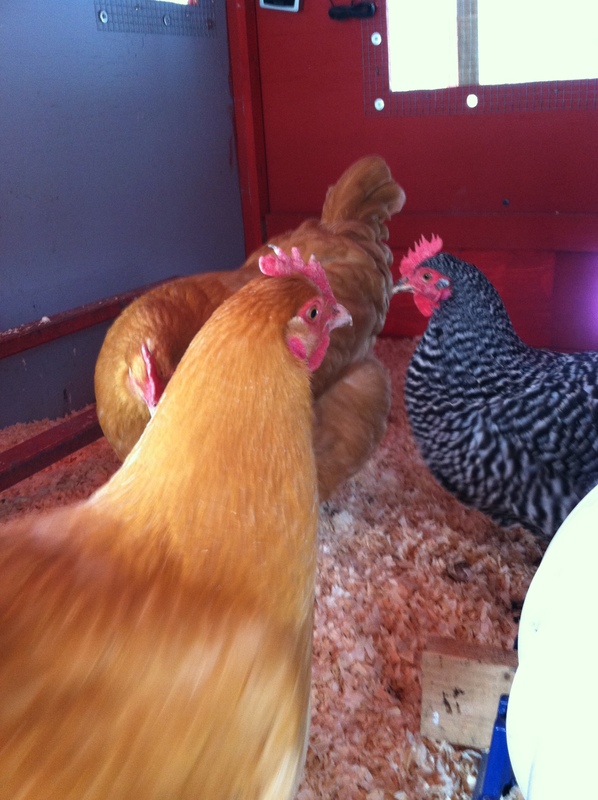 This entry was posted on Friday, May 31st, 2013 at 4:00 pm	and is filed under Backyard chickens, Chicken Nutrition, Chickens, Compost, Egg eaters, Eggs, Uncategorized. You can follow any responses to this entry through the RSS 2.0 feed. You can leave a response, or trackback from your own site.